November 2016 Pisces Horoscope predicts that the House of Career is very powerful this month. You should concentrate on personal achievements and professional matters. Psychological issues and domestic concerns can be pushed away for the time being. Career success will make you and the family happy. The Pisces have to use their charm and grace to achieve their goals in 2016 November. Things can be done by conciliation. Aggression will not yield results. You have to flow with life and accept whatever happens. Career, spirituality and finance will be the main areas of action this month for Pisces born individuals in November 2016. There will be many opportunities for enhancing your intellectual capabilities. 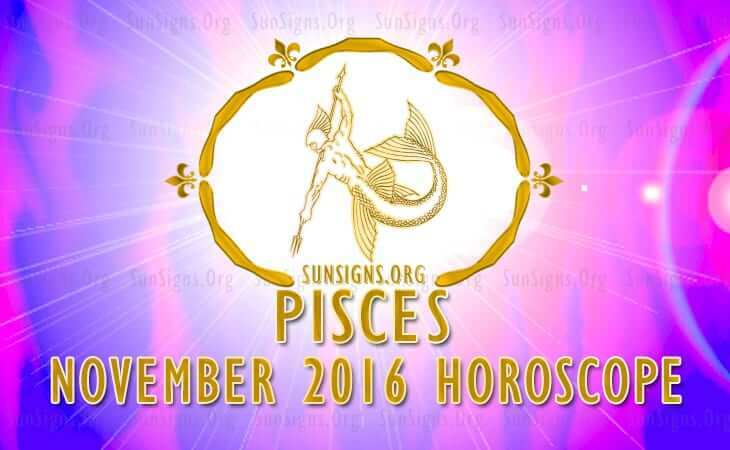 The Pisces 2016 November predictions suggest that you are at the annual peek of your career this month. You should not forget your moral values while achieving professional success. Career and business development will be excellent this month for the Fishes. You can expect recognition and financial rewards in your profession. The November 2016 Pisces astrology forecasts suggest that overseas investments or dealings with foreigners will be profitable. Monetary progress for your spouse or lover is wonderful and you can expect help from that source. You can put your money in logistics, energy and educational fields. Pisces, you should be careful about your spending habits as you feel like splurging unnecessarily. You need to start saving right now! Pisces, spiritual guidance will aid your financial plans and investments in November 2016. As a consequence, if you assist others to grow financially, you will further your fiscal progress. The 2016 zodiac forecasts for the Pisces in love say that this month will be wonderful for passion and romance. It can also be erratic with make-ups and break-ups in relations happening without warning. You will try dating people online. You will come in contact with people of influence and of higher positions while chasing love in November 2016. Complications in Pisces zodiac compatibility may arise as you want your space while nurturing love ambitions. Family harmony is disturbed with conflicts in the family. Single Pisceans will find love in spiritual and academic environments in November 2016. Children and pregnancy related news will make you apprehensive. The Pisces health will be superb till the end of November 2016. You have to unwind more after that to remain fit. Music therapy and Reiki healing can give you peace of mind. The Pisces 2016 November horoscope foretells that spirituality and inner peace is the essence for your success in career and finance this month.